September 1 is Labor Day this year, and here in southern New England we were treated to a spectacular late summer day, with a clear blue sky, comfortable temperatures, and just a hint of autumn in the air. For the 12th straight year, Choate Cross Country competed in the New Haven Road Race, an event which marks the start of our fall campaign. 22 boys from our team laced up their shoes in a field of some 5000 runners and acquitted themselves quite well. The results are a harbinger of a promising season ahead. Since watching the tennis in Queens a week ago today, I have seen precious little of the action at this year's U.S. Open, since the opening of school has filled up most of my free time. I did get to see the fifth set of Roger Federer's fourth-round match today against Igor Andreev, in which the #2-ranked Swiss player held tough under pressure. On the one hand, it's troubling that Federer is being taken to five sets by a player he owned in the past. But with an upset on the horizon, he showed he was able to steel himself to advance to the quarterfinals. I think Roger has a decent shot at fifth straight title in Flushing Meadow, even with Djokovic as a potential semifinal opponent and the prospect of nemesis Nadal as a likely opponent in the final. Alaska Governor Sarah Palin broke through the veil of media silence tonight with a speech designed to serve up lots of red meat to the GOP faithful. She has a compellingly folksy delivery style that had the effect of softening somewhat the barrage of blows she aimed at Barack Obama. But based on her positions, there is little doubt that this is a candidate in line with the more extremist right wing of the Republican Party. 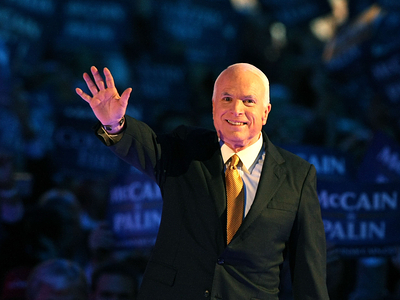 John McCain's acceptance speech tonight at the Republican National Convention was fascinating: this 25-year veteran of Congress tried to position himself as an outsider intent on changing Washington and his rhetoric suggested that his party was ready to mount an assault on the status quo--particularly ironic, considering the Republicans have controlled most of the institutions of government in recent history. While McCain said some nice things about his Democratic opponent, we heard only lip service about reaching out to independents and Democrats. I had hoped the "maverick" would be willing to speak truth to his party on topics such as global warming, torture, and immigration reform--where he's demonstrated an independent streak in the past--but that never materialized. While he seemed to reject the politics of personal attack and division, McCain's speech capped a week in which speaker after speaker engaged in mockery, sarcasm, questioning the patriotism of Democrats, and plenty of Obama-bashing. Moreover, McCain was pretty loose with the facts in mischaracterizing his opponent's positions on taxes and nuclear power, preferring to pander to the passions of the Republican delegates in the hall with ready-made applause lines. In the past four days in St. Paul, Minnesota, we heard precious little in the way of new ideas. Instead, lots of (admittedly stirring) personal biography, some harsh attacks, and loads of faux patriotism dominated the proceedings. It was clear the name of the sitting president was taboo. I certainly had hoped to hear some fresh thinking on the economy, the topic most Americans identify as their highest concern nowadays. It would have been nice if we had been offered solutions, rather than cheap shots and one-liners this week. 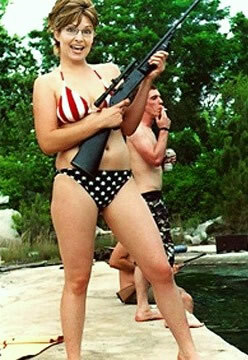 The convention provided ample evidence that Karl Rove's lieutenants are firmly in control of the McCain campaign now. That is especially worrying, since George W. Bush in 2000 promised to govern in a bipartisan fashion (as "a uniter not a divider") too, and then presided over the most rabidly partisan administration in memory. I think John McCain can rise above that standard, but we will need to see signs that he's willing to challenge his own party a lot more in the 60 days left in this campaign. Check out this clip from Jon Stewart's show with some prominent political and media figures caught in some, um, rhetorical gymnastics. This is priceless! 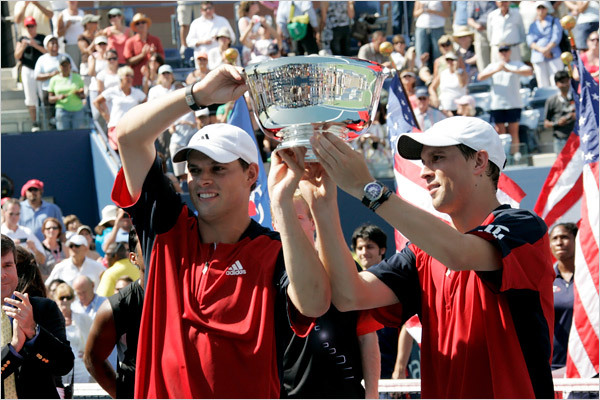 Congrats to Bob and Mike Bryan for winning the U.S. Open title without dropping a set. Can these guys really be 30 already? I remember seeing them at coaches conventions when they were like 15. Always an infusion of energy on the first day of classes in a new school year! Glad to be back in action. 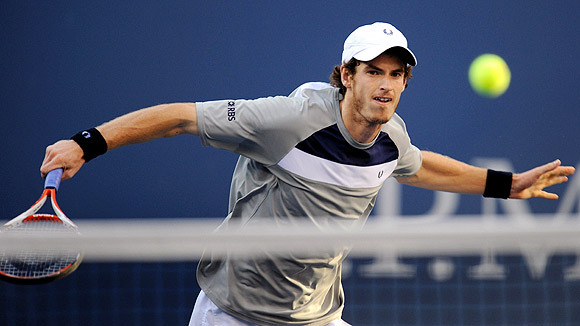 Andy Murray advanced to the U.S. Open men's singles final with a dramatic win against #1 player Rafael Nadal over two days. Though the British player held a 2-0 advantage in sets when play was suspended on Saturday, Nadal was up a break in the third. It looked like the Spaniard would set up another Grand Slam final against Roger Federer when he took that third set and appeared comfortably ahead in the fourth. But Murray found a way to do what no one else yet has: he ran Nadal ragged around the court. Rafa actually looked tired (!) after the penultimate point of the match and, with a half-hearted drop shot that he barely tried to cover, surrendered the final point looking pretty spent near the end of an incredible breakthrough season. So now Murray will face The Fed--who has been my tournament pick since before the event started--for the U.S. Open title. 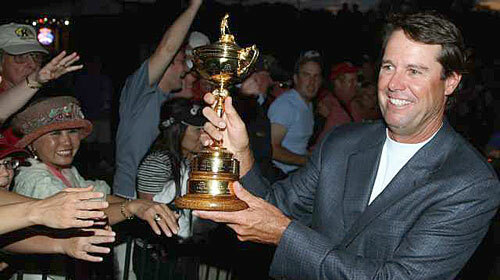 Has It Really Been Six Years Since This Last Happened? Congrats to Serena Williams for her stirring win in the women's final at the U.S. Open tonight. Hard to believe it's been so long since she dominated the game, at one point holding all four major titles at once. Jelena Jankovic played well, and this final was as good a match on the women's side as we've seen in years. And seeing the sheer delight so evident on Serena's face upon victory was pretty cool. 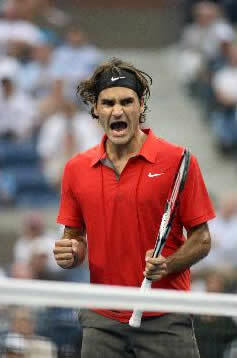 Roger Federer served notice that he's hardly washed up at age 27, winning his 13th major singles title--one shy of the record of 14 held by Pete Sampras--in defeating Andy Murray for the U.S. Open crown. I had picked Federer to prevail before the tournament (I'm on a roll, having also tipped Nadal to win Wimbledon) and he looked like the Roger we've been watching since 2003. Credit to Murray for a terrific tournament; this guy is going to be a factor in the months ahead. He made a good case for being considered among the Nadal/Federer/Djokovic faction atop the men's game. Apple is hosting a special event today, one of those occasions when Steve Jobs dazzles the world with new toys. 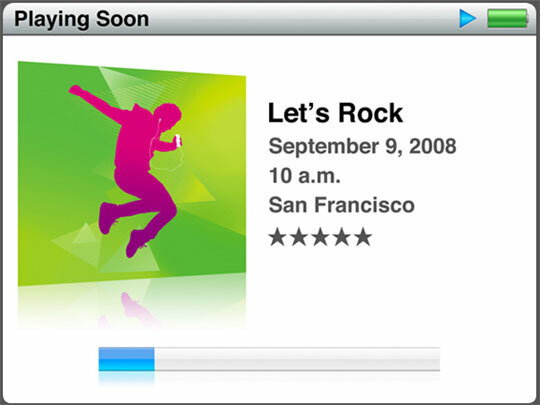 Expected today is an update to the entire iPod line, including a new Nano form factor, as well as the next version of iTunes, supposedly with a "Genius" feature that recommends music based on your playing habits. And who knows what other surprises the folks in Cupertino might have in store for us? 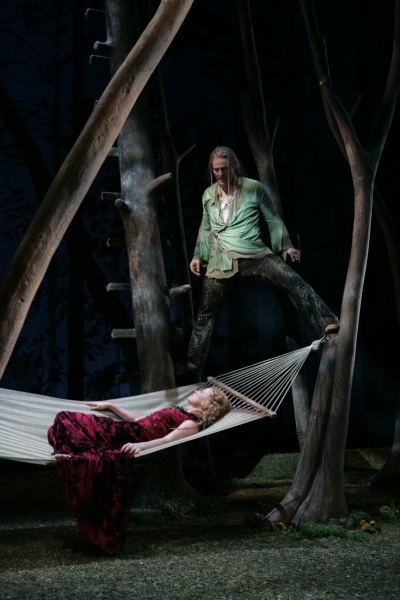 I saw an excellent production of A Midsummer Night's Dream at the Hartford Stage Company tonight. The play was nearly perfectly cast, with an athletic, spirited troupe of actors. The sets, lighting, background music, and other production values were first-rate as well. This was the sort of performance that makes Shakespeare perfectly suitable for the modern audience. 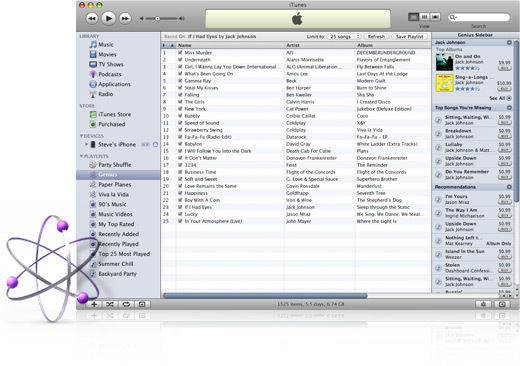 I've been playing with the iTunes update since I downloaded it last night. I like the new visualizer a lot. And the Genius feature is a nice improvement, too. I have noticed it doesn't work for Beatles songs, though . . . very curious. It was pretty classy of both campaigns to suspend political campaigning in light of the 9/11 anniversary. 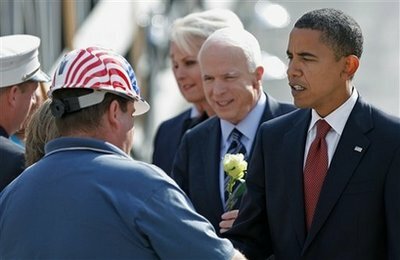 Obama and McCain appeared together in New York, signaling national unity in the observations in honor of the victims of the terrorist attacks seven years ago. No choice now: I opted to keep the old Facebook interface for as long as I could, but that's no longer possible. I liked having everything on one page with the old design, but I suppose I can live with the new one. I was dragged to a movie tonight that was the paragon of the "chick flick" genre. In fact, the film literally had no men at all on screen--not even walking on the streets of Manhattan in the background--except for a newborn baby in a quick scene. The cast was good (Meg Ryan, Annette Bening, Candace Bergen, et al.) but the movie I could have done without. It's sad to learn that one of my favorite writers, David Foster Wallace, was found dead earlier tonight. Wallace wrote the (massive) novel Infinite Jest as well as a number of brilliant essays, characterized by their expansive and often humorous footnotes. The guy was truly a genius as a shaper of prose. One of his best pieces, an analysis of Roger Federer's game, I referenced on this site a couple years ago. Wallace was a junior tennis phenom himself and wrote about the game with great insight and wit. He will be missed. Today I got my iPhone set up to access the wireless network here on the Choate campus. This will make the web-based functions much quicker than when I have to use the pokey AT&T Edge service. And since I spend most of my time on campus, that is a big plus. 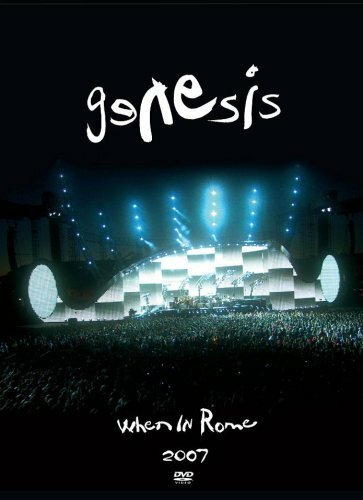 I picked up the 3-DVD When In Rome package, showcasing the 2007 Genesis world tour (which I caught in Hartford last fall). This item was only available at Wal-Mart, and I was lucky to find one in the Wallingford store. Like the latest Eagles release and the recent Journey CD/DVD set, it seems Wal-Mart is lining up exclusive distribution deals for some juicy entertainment products to get people into the stores. Worked in my case, I guess. I'm told the BBC series Spaced is quite funny, so I ordered it on DVD. Now this is one more box in my backlog of shows to get caught up on (along with other British imports such as the complete Prime Suspect collection, the second series of Life On Mars, and the last few episodes of Skins, not to mention the home-grown stuff waiting for me: the fifth season of The Wire, the last few Mad Men and Weeds episodes and the last bunch of Friday Night Lights from last year). And since the new television season is getting underway, I'll want to stay current with The Office, 30 Rock, Heroes, Lost, and such. But I find it hard to find time to watch TV regularly. I spent some time online tonight, purchasing tickets for the months ahead: four Haydn & Handel Society concerts in Boston (including the annual Messiah in December), four operas at the Met (La Damnation de Faust, La Bohème, Rigoletto, and Cavalleria Rusticana/Pagliacci), and two Broadway shows (Boeing-Boeing and Gypsy). I spent a pile of cash, but am looking forward to some excellent entertainment. 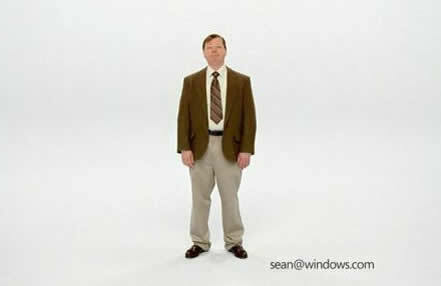 Microsoft has created a clever response to Apple's "I'm A Mac" commercials, playing off John Hodgman's "I'm a PC" character in this new advertisement. I caught a performance of The Comedy Of Errors here on the Choate campus tonight, performed by a touring troupe of seven actors. The show was a bit uneven, but given the limitations inherent in scaled-down production values and a small company, it was reasonably energetic. I have loved everything Ricky Gervais has done: the original British version of The Office, the podcast series, and Extras. So it was a no-brainer that I would check out Ghost Town, featuring his first leading film role. This was a pleasant little dramedy, with an engaging cast, some funny perfomances (subtler that the usual Gervais shtik), and a sweet message. It's sort of a "chick flick," I suppose, but one worth seeing. I spent much of this morning at the Irish-American Community Center down in East Haven watching a satellite feed of the All-Ireland Senior Football Championship between Kerry and Tyrone. GAA football is sort of a cross between soccer and rugby, a fast-paced game that is fun to watch. A full Irish breakfast was served, which was quite a treat. 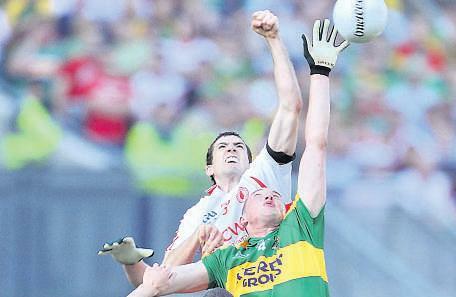 And Tyrone stopped the three-peat by Kerry, winning by just one point. Today the U.S. beat Europe to win the biennial Ryder Cup golf competition, which has been dominated by the Europeans in the past decade. On the other hand, the American Davis Cup fell to Spain 4-1 in a semifinal tie on a slow clay court in Madrid. Win one, lose one, I guess! Tonight marked the final game in The House That Ruth Built. I've seen quite a few games in Yankee Stadium since I was a boy, so it's tough to see this landmark of sport fall under the wrecking ball. Today is the first official day of fall. 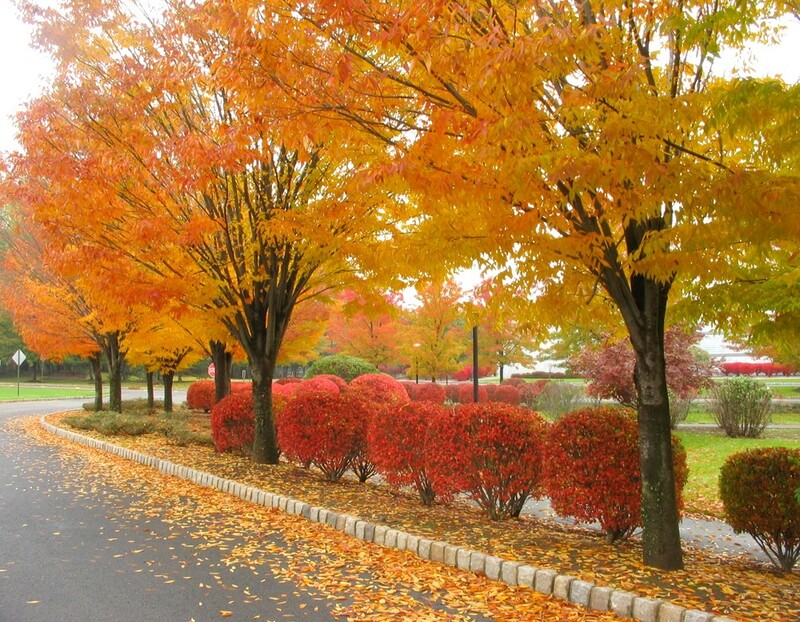 There's a hint of color atop a few of the trees in Wallingford, but it won't be long before my New England environs look like the picture above. The Season 3 premiere of Heroes arrives on NBC tonight and the early buzz is good. It will probably wait on my DVR a day or two before I have time to view it, but I am looking forward to tonight's double episode. 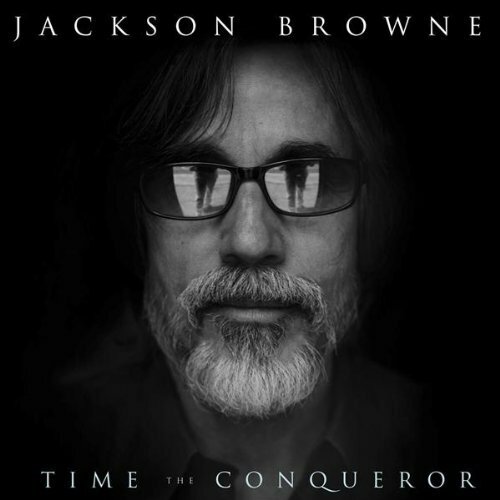 Consummate singer-songwriter Jackson Browne has a new album out today: Time The Conquerer. That title may be particulary apt, given his gray beard on the cover photo, which makes the usually youthful-appearing Browne look his actual age; he turns 60 next month. 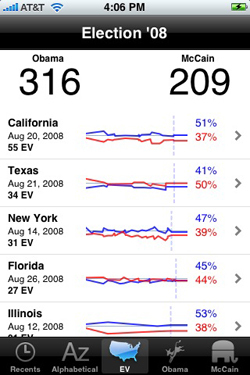 If you are an iPhone user and a political junkie like me, you should download Election '08 from the App Store: it provides the latest in state by state polling for the presidential contest, with a projection of the Electoral College tally. You know how you get a song in your head and you have to listen to it repeatedly day after day? I am in that mode right now with "The Carpet Crawlers," a tune from the Peter Gabriel-era of Genesis. 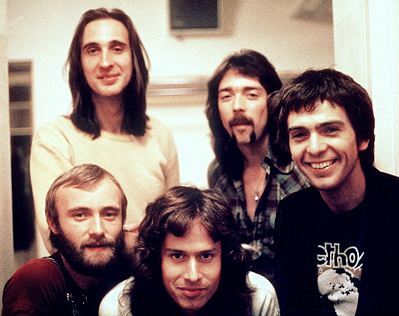 The song is originally from 1974's The Lamb Lies Down On Broadway, but the version I tend to listen to is the 1999 re-recording wherein the lead vocals are split by Gabriel and Phil Collins. The song was the final encore at the Genesis concert I saw in Hartford I saw a year ago. And now it's in my head but good for some reason. 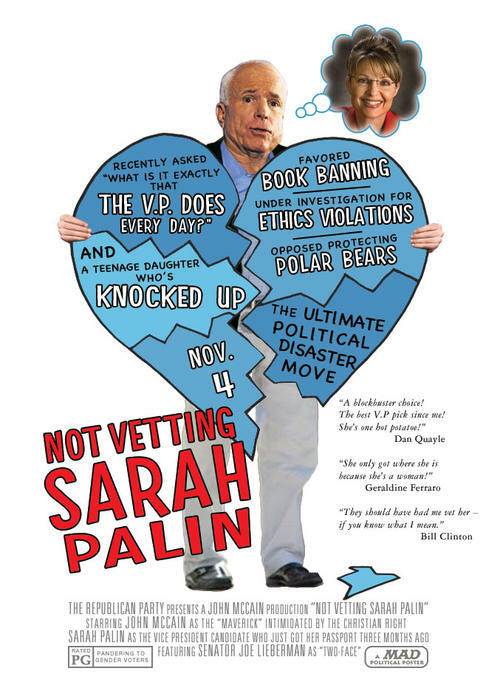 Not only is Sarah Palin a fraud, she's the tawdriest, most half-assed fraud imaginable, 20 floors below the lowest common denominator, a character too dumb even for daytime TV--and this country is going to eat her up, cheering her every step of the way. All because most Americans no longer have the energy to do anything but lie back and allow ourselves to be jacked off by the calculating thieves who run this grasping consumer paradise we call a nation. 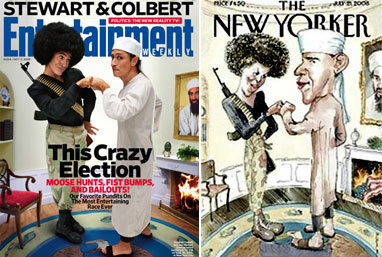 For this week's cover of Entertainment Weekly, Stephen Colbert and Jon Stewart brilliantly send up the controversial cover of The New Yorker published earlier this year. 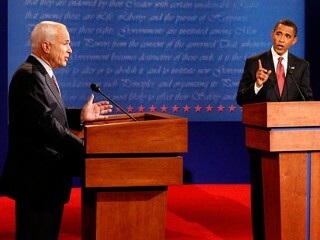 Last night's debate between candidates McCain and Obama was surely lacking in fireworks. There were no devastating gaffes, and no clear slam dunk moments either. The Democrat started strongly and appeared somewhat more surefooted on the economy questions. The Republican was visibly more at home with foreign policy later in the debate. Hard not to call this one a tie. But since McCain is starting to nosedive in the polls, he needed a big win and he certainly didn't get that. Moreover, since Obama appeared to hold his own with the foreign affairs topics--supposedly his opponent's strongest suit--he may have established himself as a more convincing commander-in-chief with undecideds. I watched the debate on CNN and was most interested in the focus group feedback of the independents, as represented by the white line on the meter at the bottom of the screen. These voters seemed to dial downward whenever either candidate made an aggressive attack. My informal gauge of the data was that Obama did better with the independents, at least those in the CNN studio. The consensus of other polls done in the last twelve hours confirms that. It's a bit scary when the Saturday Night Live writers get their material word-for-word from the news shows. This sketch was less a parody than a replay of the Couric/Palin interview! Just as I am wrapping up a unit on Congress in my American politics and government class, the House of Representatives jumps to the lead story in the news cycle with the dramatic vote on the financial rescue package. I was discussing in class how each legislator has to vote based three primary considerations: the desires of constituents, his/her personal beliefs and analysis, and the needs of the party and other organizational demands. Clearly the third category was deemed far less important than the first one for many of the Congressmen just five weeks before Election Day! 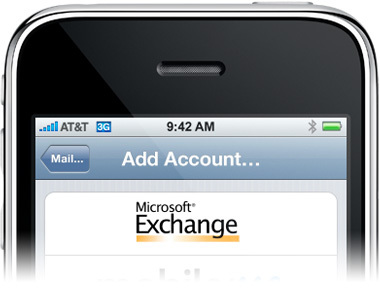 In the last few minutes of my MetroNorth trip from New Haven to Grand Central tonight, I was able to accomplish what proved elusive for months back home: I activated the Exchange syncing so my school account--my primary e-mail address--is now accessible on my iPhone. I'm not sure if my e-mail messages following me everywhere I go is a good or a bad thing, but I'll try it for at least a week to see. This page contains all entries posted to As Far As You Know in September 2008. They are listed from oldest to newest.